The Starfish holds characteristics such as guidance, vigilance, inspiration, brilliance and intuition. They are resilient; you can’t keep a Starfish down as they regenerate their limbs if one breaks off. 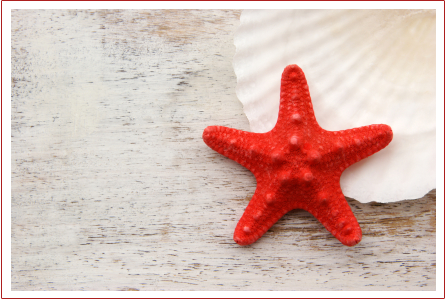 A Starfish is an indication that you have many options to weigh and decisions to make. We are wise to emulate the Starfish and its’ resiliency – managing what life brings our way be it a loss or a change and not letting it keep us down. Adapt a positive attitude, Create Life Options, recognize our uniqueness and the ability each one of us has to “Make a difference”. A man was jogging down the beach after a major storm had just come through the area. He was dismayed by the huge number of starfish that the storm had washed up on the beach. He thought that there was nothing he could do because of the immense numbers. As he continued down the beach he saw an old man throw something into the water. As he got closer, he saw the old man walk a little farther down the beach, bend over, pick up a starfish and throw it back into the water. As the jogger approached, the old man stopped again, bent over, picked up another starfish and was about to throw it into the water.